LEGO Designs: Easy and Fun Ideas That Anyone Can Make! Building LEGO Designs is great fun. Taking a big pile of LEGO bricks & elements, and creating something new from them is exciting, challenging and a learning experience. We are excited to bring you some great LEGO designs that you and your boys can build. We will have simple designs, as well as more complex designs for more experienced builders. Some of the ideas here will have step-by-step instructions and others will be ideas that you can use to start building your own creations. 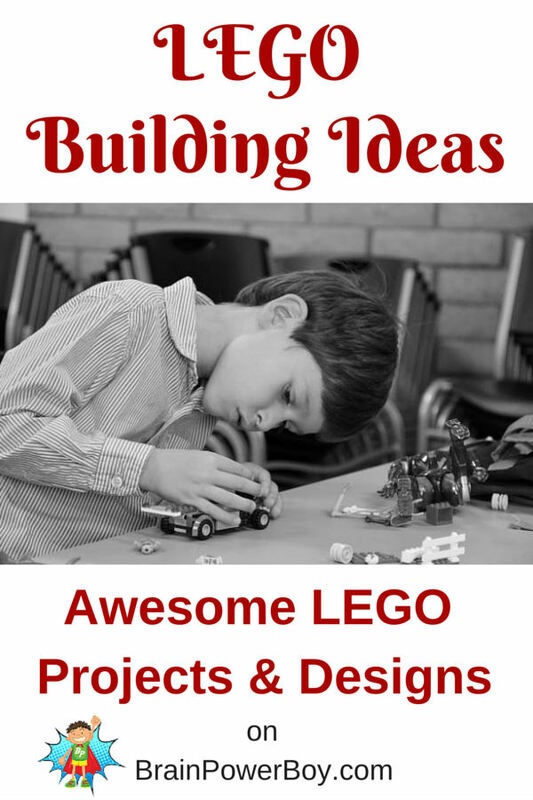 We will be adding to this page on a regular basis so be sure to pin it, save it to Evernote, or bookmark it so you can check back when you need a fun LEGO activity for your boys to do. A cute and funny LEGO Valentine heart with eyes! Build your own LEGO Leprechaun Trap. Two designs to try with tips for building. Don’t forget the gold! Try making your own Easter LEGO Designs as a mosaic. Directions for Easter Rabbit with basket, and bunny & chick LEGO mosaic designs. Here is an Easter Duck, a Easter Chick and a Easter Bunny for you to make. Includes a video showing a video showing the Easter bunny being put together. Halloween LEGO Mosaics including a pumpkin, Frankenstein’s monster and a skeleton which are all very easy to make. LEGO Christmas Builds directions for different Christmas builds including Star Wars and more. Build a LEGO Santa, tree and gift with this easy to make LEGO Christmas scene. Easy LEGO Gift Mosaics is the perfect project for young builders. Make packages with ribbons, all done in bricks! Open-ended opportunity to create your own as well. If you have a boy who love robots you must pop over to Robot LEGO Designs to get some inspiration for building your own LEGO Robot! Here are some more robots. This time they are funny Robots! I love the eyes on these lol. Incredible LEGO Star Wars Designs You can Build is not an exaggerated title! The builds included in this post are really, really cool. If you, or someone you know, is a Star Wars fan, this is a must see post. A whole lot of learning takes play when you are playing around with LEGO Designs. If you make a build with step-by-step instructions, you have to make sure you do everything that is required in order for your build to turn out. If you design something out of LEGO on your own, you have to conceptualize your idea, perhaps put your design down on paper, think about the best way to construct it, develop ways to keep the whole thing from falling apart! and much more. See also our big LEGO page for additional bricky posts we have on our site. Get your boys trying some LEGO Designs today, and if you like, please sign up for our newsletter so you don’t miss any LEGO goodness!